The Damodaram Sanjivayya National Law University’s (DSNLU) foundation stone for the construction of their new campus was laid on March 7, 2013 at Asakapalle in Sabbavaram, Andhra Pradesh. 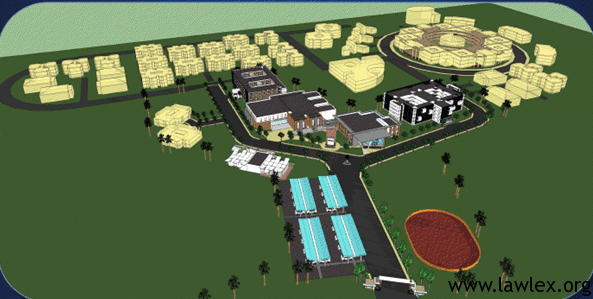 The university is being established in the sprawling 15.7 acres (first phase) at an estimated cost of Rs.77.7 crore. The university is to be built in three phases and would cover about 60 acres in the scenic hillside at Sabbavaram. The university is named after the former Chief Minister, who was a law graduate hailing from Kurnool. The Chief Guest Mr Erasu Pratap Reddy, Minister for Law and Courts, assured that the university would not face any difficulty in getting funds in future and that the buildings, that includes an academic block, administrative block, boys and girls’ hostels, and a canteen, will be ready in two years. He further added that the students should take mileage out of the prestigious university and go ahead in their life.The Law Ministry has released Rs.10 crore for immediately starting the works. The Law Minister, who is a law graduate too, said his father Erasu Ayyapu Reddy too served as Law Minister. Other important diginitaries present were Ganta Srinivasa Rao (minister for infrastructure), Pendurthi MLA P. Ramesh, Bheemunipatnam MLA M. Sreenivasa Rao, among others. Mr Ganta Srinivasa Rao said that law is one of the best way to serve the nation by referring to the freedom fighters, a lot of whom were law graduates. The university was an outcome of former CM late YS Rajashekar Reddy’s dream but it faced difficulties in the initial years. The Vice Chancellor Prof R.G. Babu Bhagvat Kumar said that the university presently located in MVP Colony started with 56 students in 2008, but today has a strong student community of 300 students from 16 different states. Now that the campus construction has started and facilities are being assured, expectations of everyone in and out of the university has gone high. The vote of thanks was proposed by the Registrar, Prof. Pasala Sudhakar. The students in the university are doing well in academics as well as extra-curricular activities. Recently, the parliamentary debate team won second prize in the national parliamentary debate at CNLU Patna. The Chancellor, Prof. A. Lakshminath (who is also the vice chancellor of CNLU Patna), wished that the university becomes one of the top preferred law universities in the country.